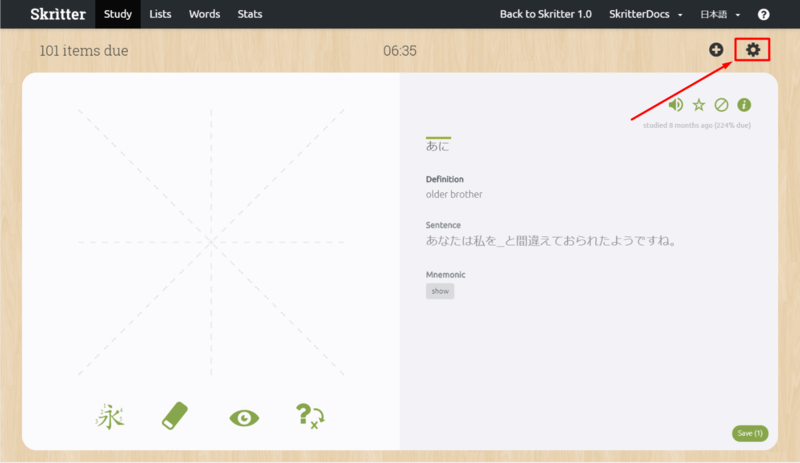 The study screen is where all the action is -- it's where you practice words, whether they are new or pending review. 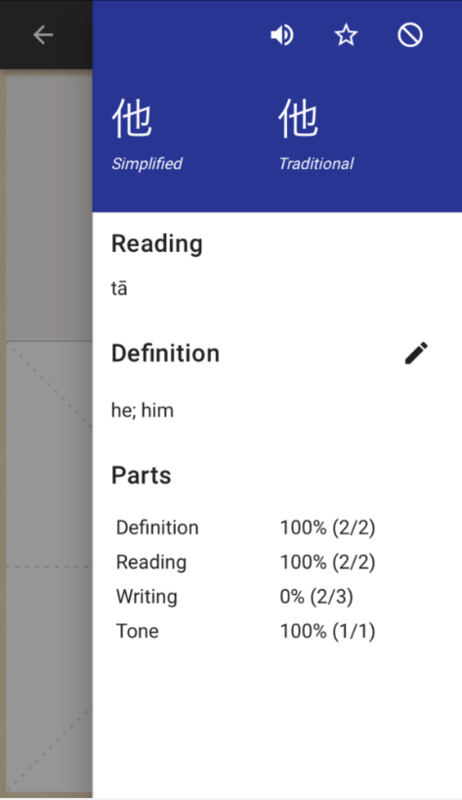 In addition to practicing / reviewing, you can add new words manually, change Quick Settings, and view more detailed information directly from the study screen. 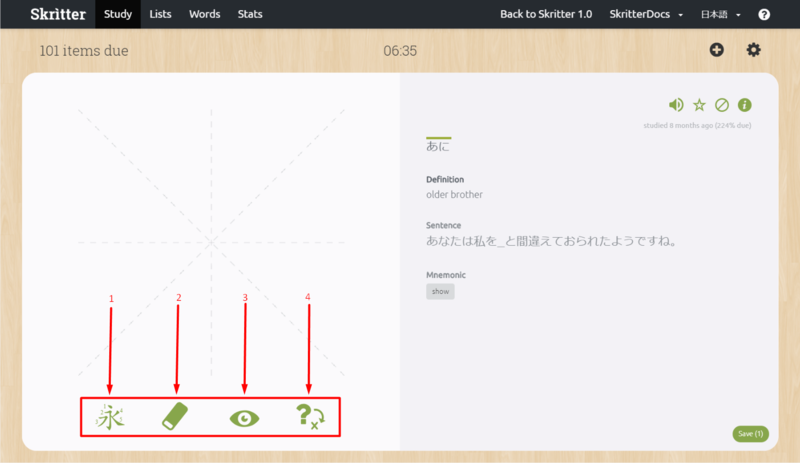 The canvas is where you answer the various prompt types. 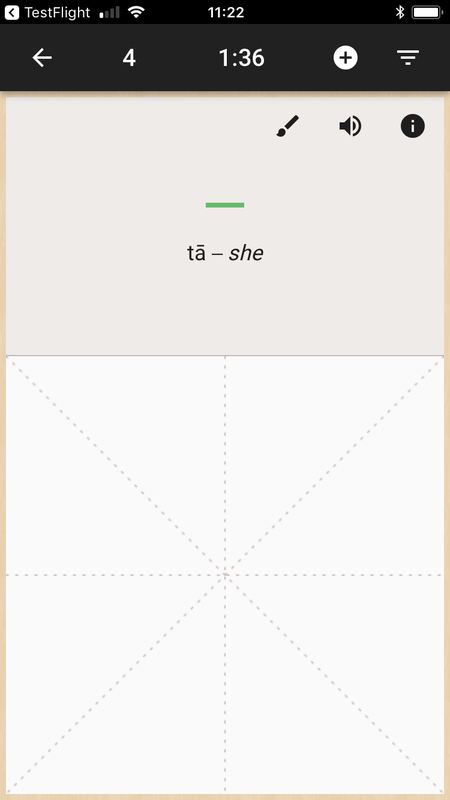 This is where you trace the strokes on your screen, or tap to reveal reading, definition and tone prompts. 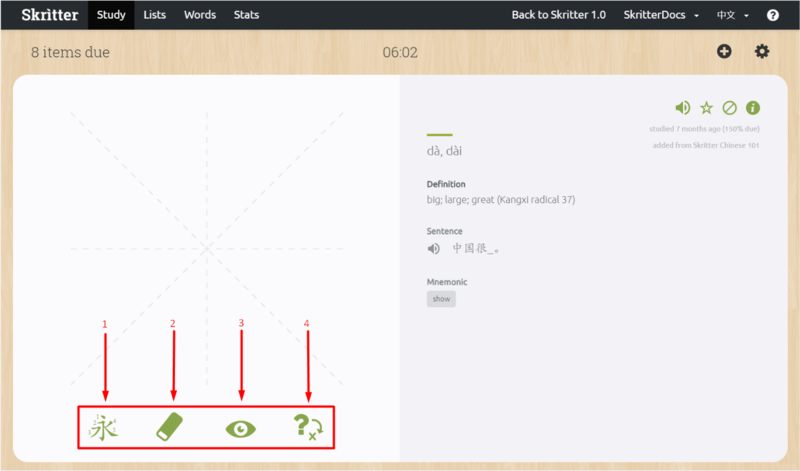 Once a prompt is complete, a set of grading buttons will display at the bottom of the canvas. 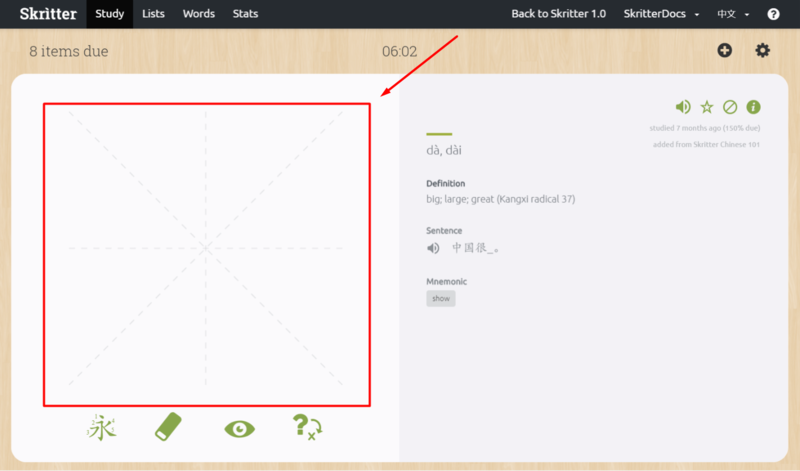 Tap the add word (+) button at the top right hand side of the study window to manually add a new word at any time. The settings gear is where you can adjust your study settings. For a comprehensive guide on the settings gear, please refer to this guide. 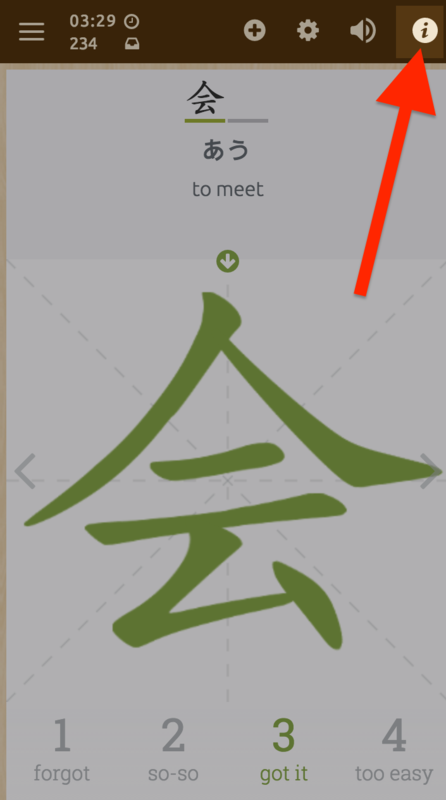 Tap the stroke order button to have a step by step guide to the character in the correct stroke order. Tap the correct / incorrect toggle button to switch the character's grade from incorrect to correct and vice versa. 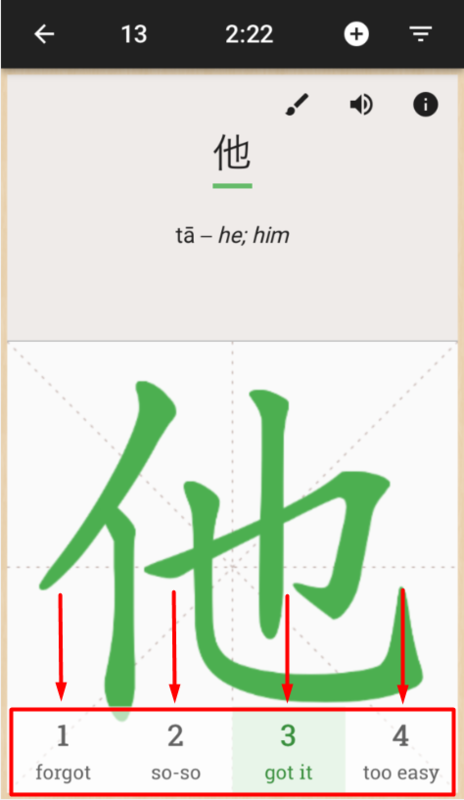 Tap the speaker icon to replay the audio pronunciation. Tap the star icon to star or unstar a word. 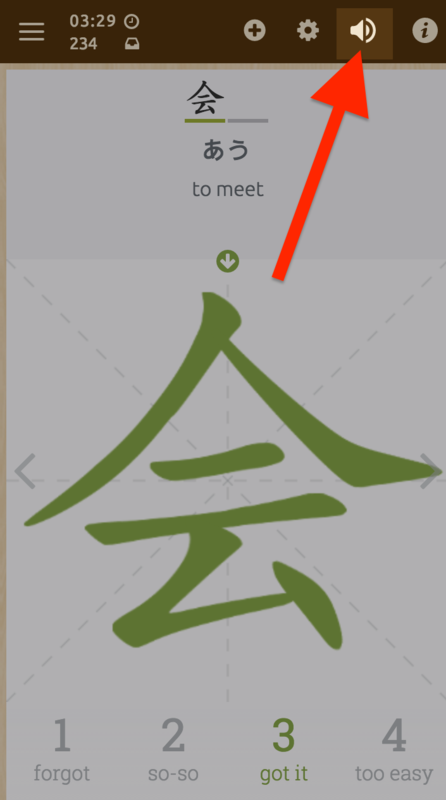 Starred word can be viewed in in your Words, under " Starred". Banned words can be viewed under Words, then Banned. Tap the (i) info button to view more detailed information on a word, or reference various dictionaries. The study timer keeps track of how much active study time you've spent for the day. Active study time means time spent thinking of answers or actively writing. The timer will pause on an answered prompt, and it will time out after 30 seconds (in case you walk away on an unanswered prompt). 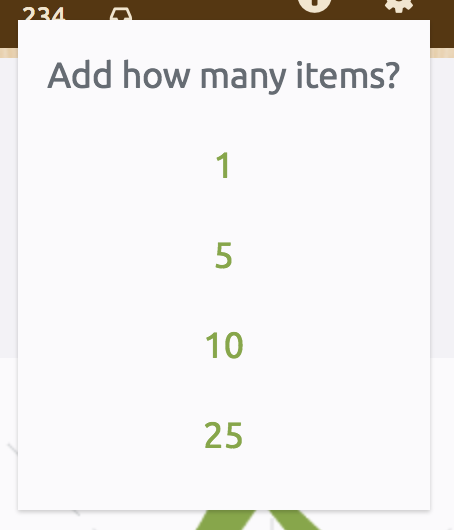 If you are studying multiple lists at once, the system take turns adding from them as it would with automatic word adding. Manually adding a word with the add word button doesn't affect automatic word adding if it is enabled in your account's study settings. 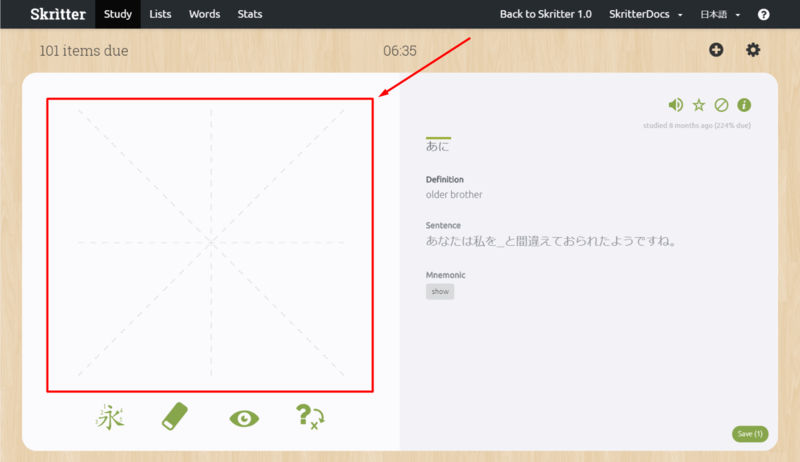 Filter parts: Check or uncheck the boxes to adjust which parts you'd like to study. 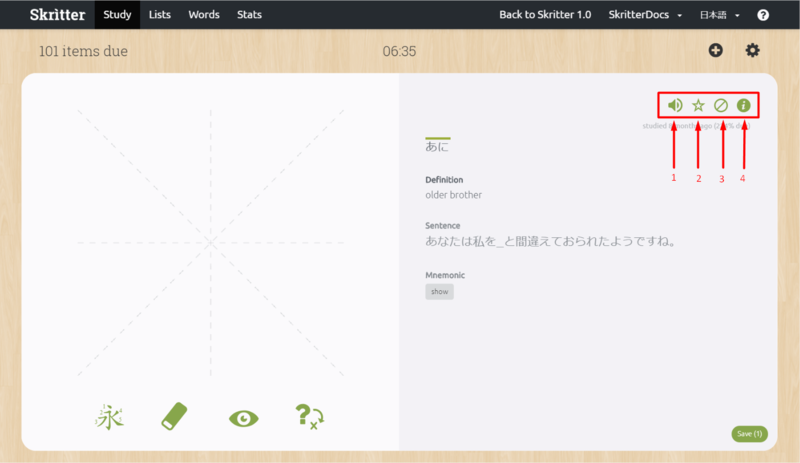 Filter styles: Check or uncheck the boxes to adjust which character styles you'd like to study. Audio enabled: Automatically play audio on word / character prompts. 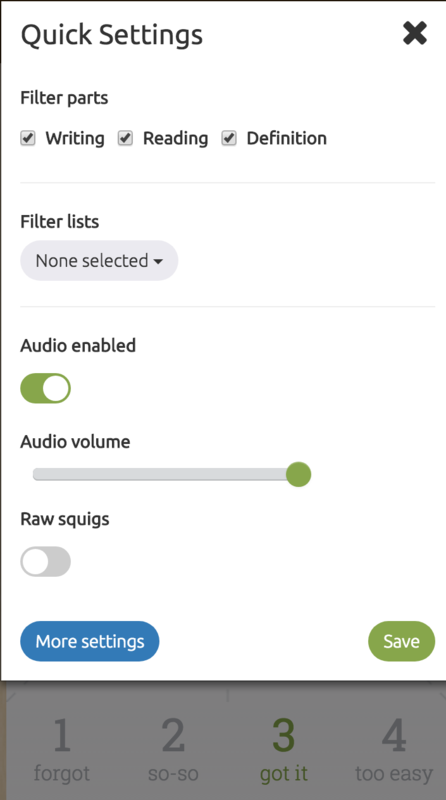 Audio volume: Adjust the slider to increase or decrease Skritter's audio volume. 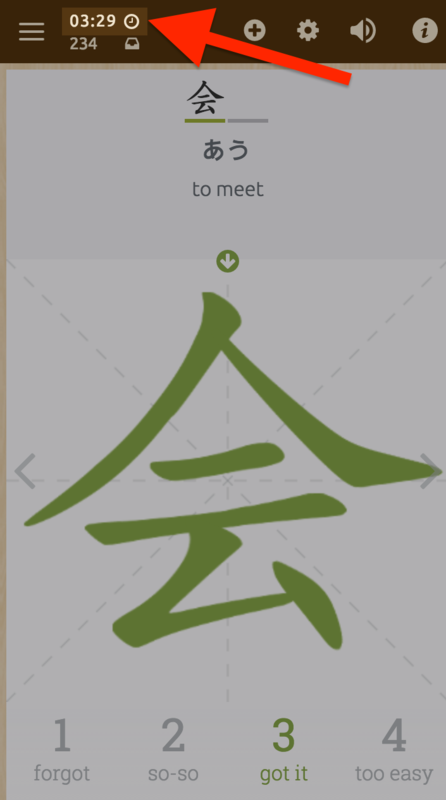 Raw squigs: Show your own handwriting. 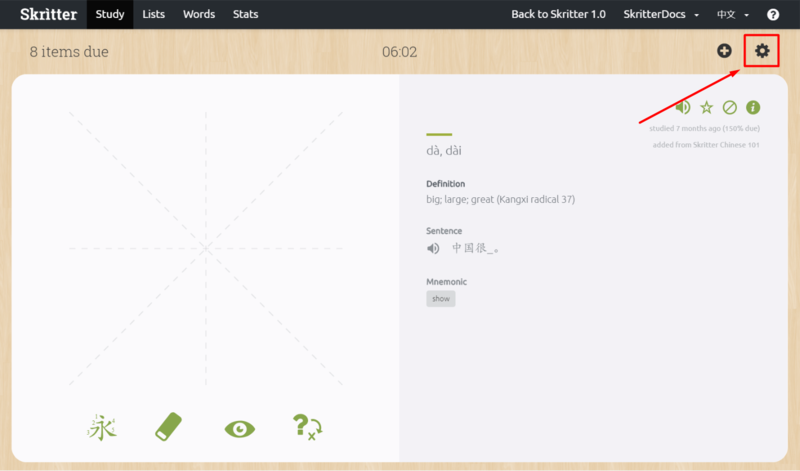 After finishing writing a character, your handwriting will be compared against Skritter's. Make sure to press "Save" to confirm your changes. 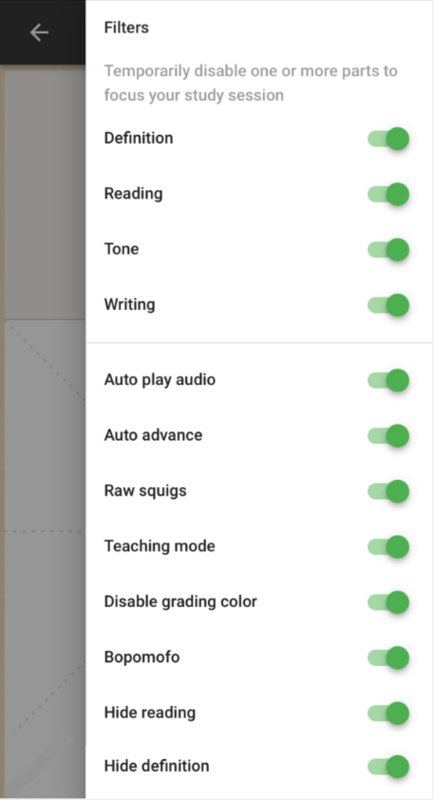 For more study settings, tap the "More settings" button. 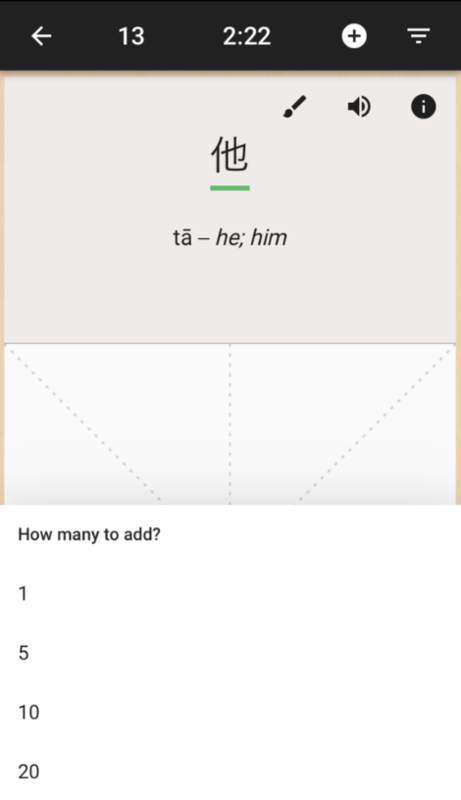 Tap the audio icon to replay the sound for the current prompt. Star word : Tap the star icon to star the word. 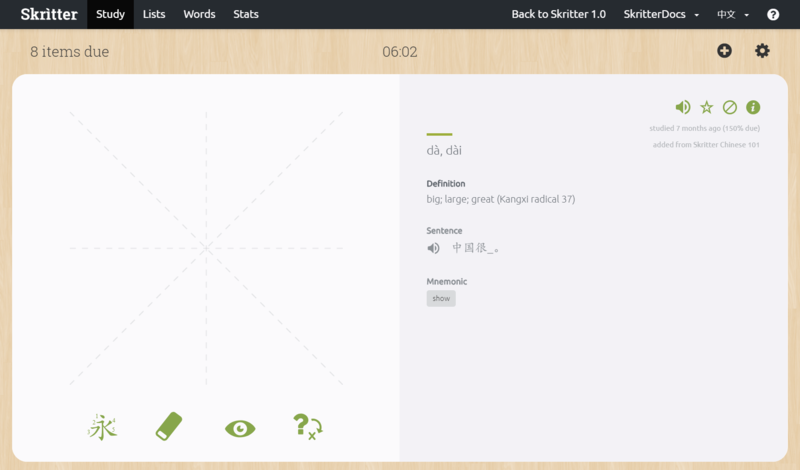 Starred words can be viewed on the Words page. Ban word: Tap the ban icon to ban the word. Banned words are removed from your studies, but can be un-banned later. Pleco icon: Tap the Pleco fish icon to look up the word in Pleco. (The Pleco app is required for this icon to show). Characters contained: A breakdown of the characters listed in the current word. Example sentence: An example sentence using the current word. 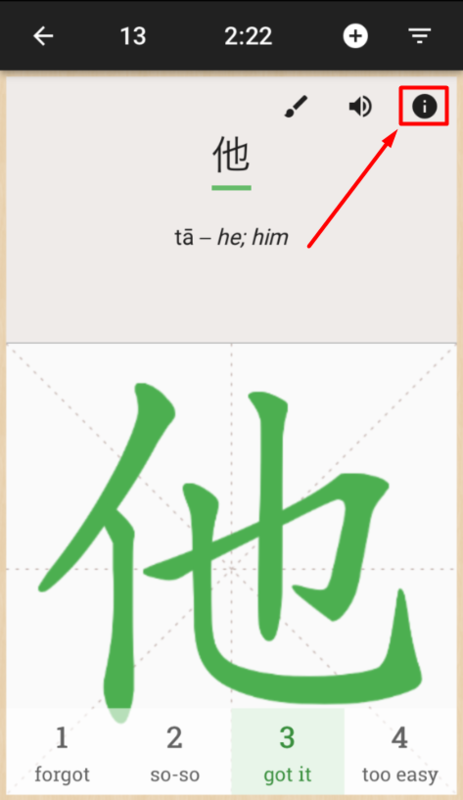 Mnemonic: A mnemonic for the character or word shows in this area. Tap the teaching mode button to manually trigger teaching mode. Teaching mode allows you to practice the character stroke by stroke, following along with Skritter. 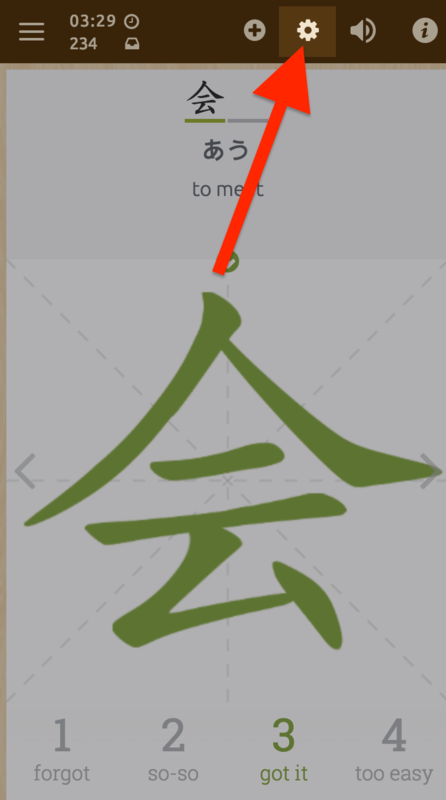 Swipe upwards on the canvas at any time to erase a character. (Manually adding a word with the add word button doesn't affect automatic word adding if it is enabled in your account's study settings). Press "More Settings" for even more settings. 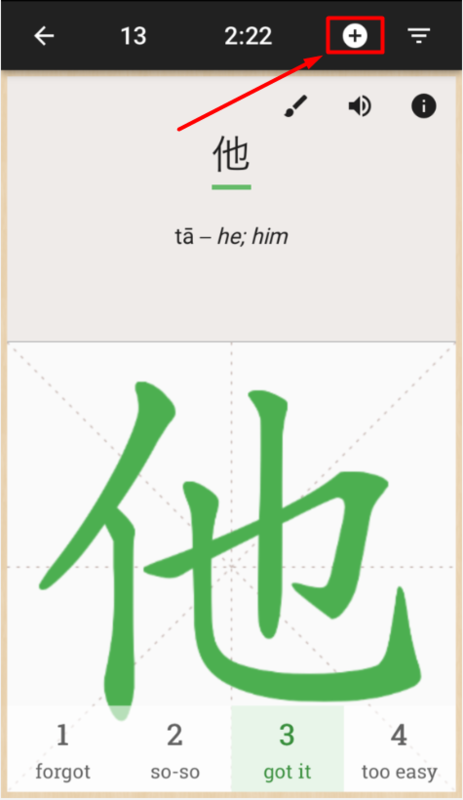 Star word: Tap the star icon to star the word. 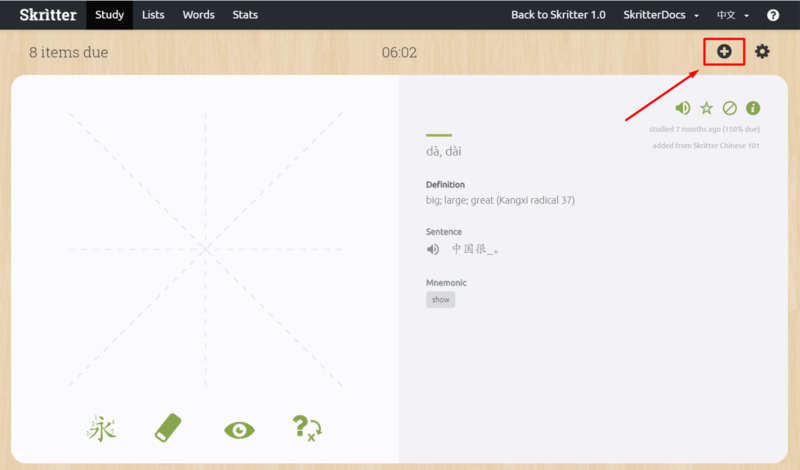 Starred words can be viewed on the Words page. 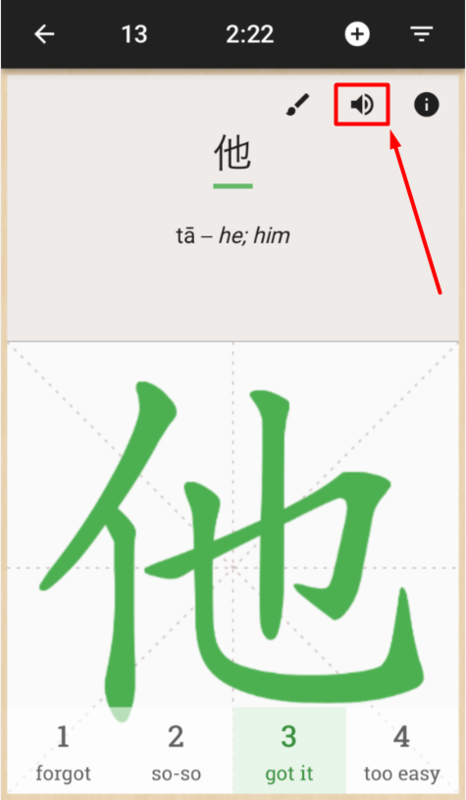 Sentence: An example sentence containing the word shows in this area (when available). 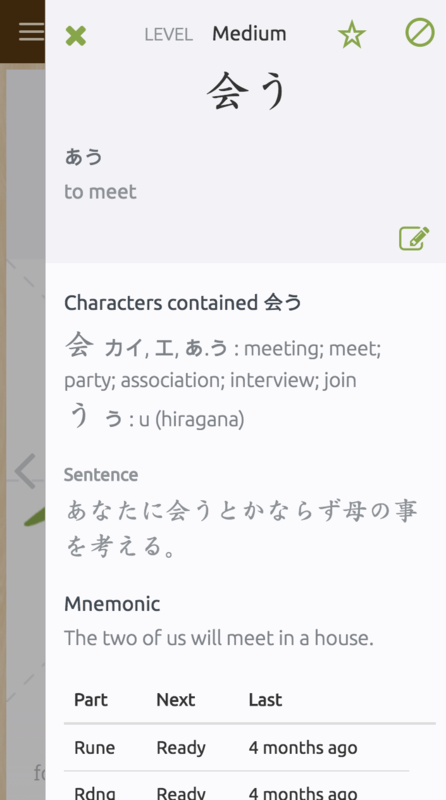 Mnemonic: A mnemonic for the character shows in this area. ap the teaching mode button to manually trigger teaching mode. 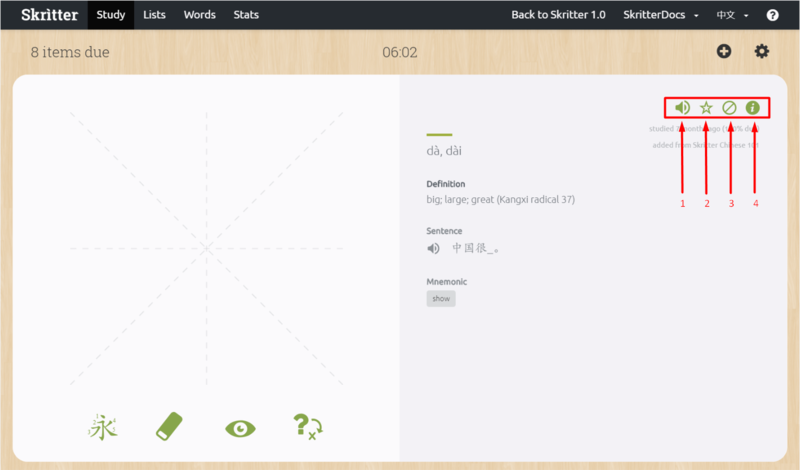 Teaching mode allows you to practice the character stroke by stroke, following along with Skritter.